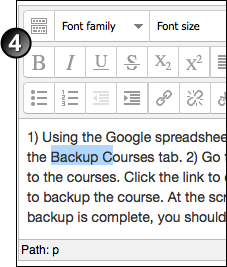 When creating course content, don't copy text from a Microsoft Word file and paste it directly into the Moodle text editor box. Word text contains formatting code that can create problems in your course display. When copying text from Word or any other application, use one or the other of the methods described on this page. Images copied from Word documents will not display in the Moodle text editor. When you properly embed an image, the image is uploaded to the course's file storage, and the text editor creates a text HTML link to the stored image. The editor itself only holds the text link (you can see this by clicking the HTML button), which the browser reads and then displays the image. When you copy and paste an image from Word, because the editor is a text editor only, you cannot save an image to it. For more complex content, you might find it efficient to copy from Word to Moodle via a web design program like Dreamweaver. When creating course content, using one or the other of the methods described below will prevent Word's formatting code creating problems in your course display. You will use the Moodle text editor most often when either the Adding or Updating a resource or activity in Moodle. (for the Updating page) clicked the Update icon for an activity or resource. If the text editor's function buttons do not display at the top of the box, click the Toolbar Toggle as shown. With this method, some or all of the Word formatting will be retained. In Word, copy the text from the source document. 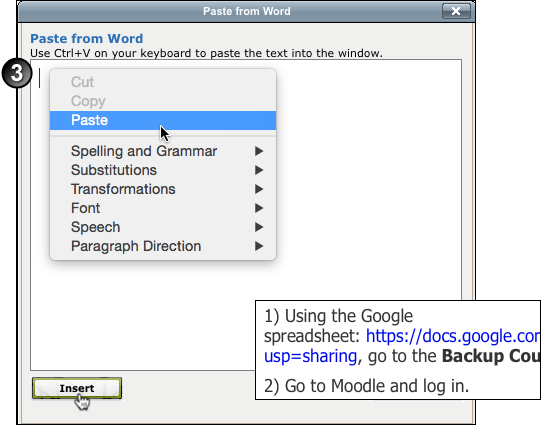 In the Moodle text editor, click the Paste from Word icon . In the Paste from Word window, paste the text and click Insert. The window closes and the text displays in the text editor. Check that it is formatted the way you want. Complete the rest of the page and save your changes. With this method, you must re-format the text after copying and pasting. In the Moodle text editor, click the HTML icon . In the HTML Source Editor window, paste in the text and click Update. In the text editor, add any necessary formatting using the Moodle text editor tools. Complete the rest of the page and save and display. the usual blocks down the side of the page. This issue is only visible when the page is displayed within the Internet Explorer 7 browser. In Firefox, the page displays correctly. However, you don't want any IE7-using students to panic when they arrive on this page. Open the same page in a different browser. Click the Edit summary/Update icon for the topic/resource/activity where the error was made. Replace the text with text copied and pasted using Method 1 above.